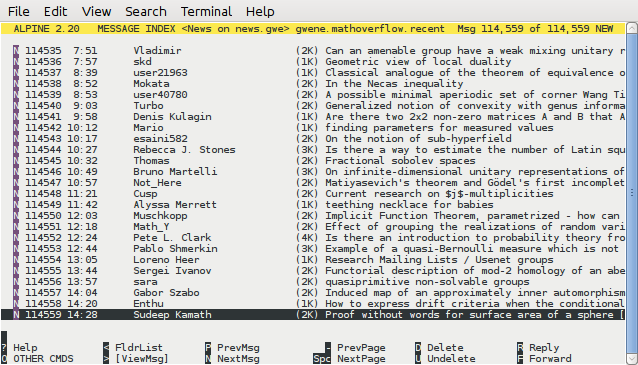 My question is that how can one configure the Pine/Alpine email client in order to read the title of MathOverflow recent questions using the service provided by the above site? Sorry if my question is off topic here. It is not unreasonable to think that there are some people on MO who use nntp to read questions (as the existence of the above link suggests). I ask this question to get help since I couldn't get help elsewhere. I asked this question on superuser 7 months ago without receiving answer. I thought there are some techy users here who can help. (I know it is possible to directly read rss feeds in some email clients such as Mozilla Thunderbird, I am just interested to read using nntp as I use the text based client Pine/Alpine). type "S" to enter (S)etup. type "C" to enter (C)onfig. arrow down to "NNTP Server (for news)", hit enter, type "news.gwene.org" or "news.gmane.org" and hit enter. Hit "E" to (E)xit setup. Press "L" for Folder List. Arrow down to News and hit enter. Press "A" to add a newsgroup. This is not something that we could easily (officially) support, as the use case here would be quite limited. However, as a self-respecting SysOp of a multi-line 80's BBS - I can't help but be intrigued here. Believe it or not, we get some support emails from people still using PINE. Heck, I used it as recently as a few years ago. I don't believe there's any easy way of having it support RSS, but a proxy could be used. Fortunately, most IMAP bindings bundled in the standard or extended libraries of popular languages can consume and also produce the appropriate NNTP feed. What's left is simply consuming RSS, putting it in a database, then producing a news feed. If it sounds like I'm volunteering to do this, I kind of am, but I don't have a lot of bandwidth for side projects. If someone wants to pick it up, I'm happy to throw some server space at it.